There are some recipes that, through their flavours, do make footprints on our hearts. Some are also so inextricably tied to a region through those same flavours it is easy to identify their origin. This roast chicken is one of them, and Provence is the place. 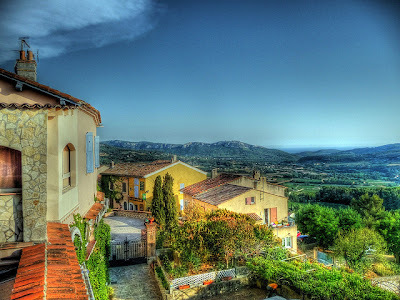 Provence is renowned for its beautiful scenery. It is also known for its cuisine. Common local ingredients used in Provence are lavender, olives, fennel, anchovies, thyme, sage, rosemary. tomatoes, bay leaves and garlic (to name but a few). 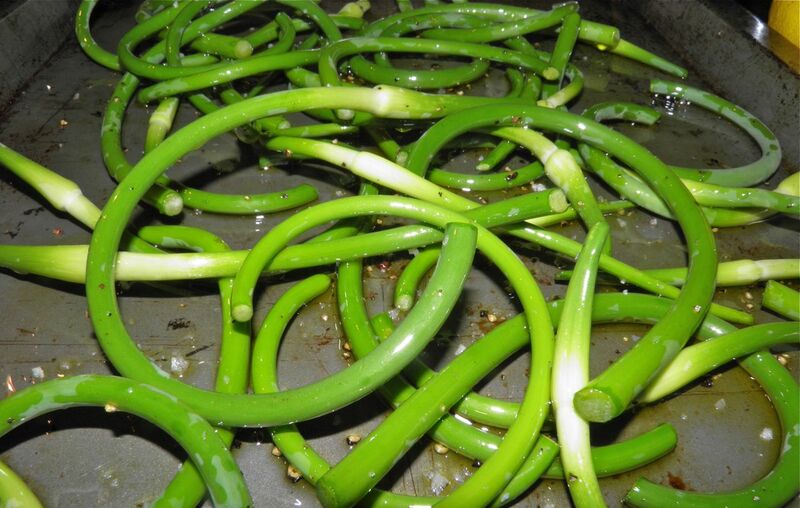 Garlic scapes tossed with olive oil, salt and cracked pepper. The combinations of these ingredients are almost endless, especially when you factor in differences in quantities. This availability of delicious ingredients has made Provence recipes favourites around the world. An interesting fact you may not know is why the region is called Provence. It’s from the Roman name for an administrative district. As they invaded they placed Provence in their Gallia Transalpina, the first Roman provincia outside the Alps. Provincia is the origin of the name. By the way, there is a terrific bestseller book called “A Year in Provence” that chronicles author Peter Mayle and his wife’s first year living in Provence after moving from London. It should be on everyone's "must read" list. The book is full of charming, witty, funny and sad interludes. It is available on DVD from the A&E miniseries as well, if you're so inclined. This Provence inspired chicken is bathed in a compound butter of garlic and rosemary. The trick is to loosen the skin on the chicken and slide the butter underneath. Then as the chicken bakes it bastes itself and imparts the flavous in the butter throughout the meat. Just for good measure put a lemon inside the chicken so the lemony flavour steams the chicken from inside as the garlic and rosemary bathe it from above. This was a great roast chicken and the two side dishes take no work at all. 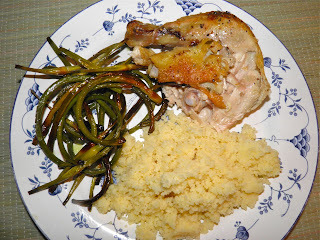 If garlic scapes are not available you could substitute any of several roasted vegetables in their place. You should try this recipe soon and enjoy the flavours of the south of France. Note the yellow under the skin. That's the compound butter. Peel and chop the garlic cloves. Mix with the butter. Pat the chicken dry with paper towels. This helps in creating a crispy skin. Place the chicken on a board and carefully loosen the skin on the breast and legs. Take as much care as you can not to tear it. 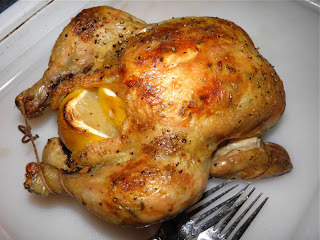 Using your hands, take the butter mixture and spread it around on the surface of the chicken meat underneath the skin. Make sure it’s well distributed. Take the olive oil and rub the surface of the chicken. Then sprinkle the surface with salt and pepper. Just before placing in the oven, put the two lemon halves in the body cavity of the chicken. Tie the back legs to contain the lemon inside. 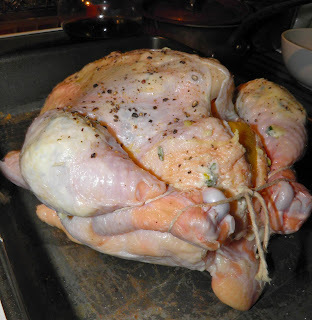 Roast in the centre of the oven for about 30 minutes per pound (1.5 hours). No basting is necessary. Test for doneness using a meat thermometer in the thickest part of the bird. It is done when the internal temperature reads 180°F. About 30 minutes before the chicken is done, start the scapes. 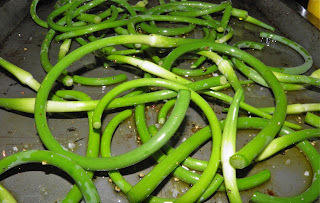 Wash and chop the scapes into the desired length. Toss with olive oil to coat well on a baking tray. Sprinkle with salt and pepper. Place in the oven with the chicken for the last 45 minutes of roasting. Take care to ensure they don't darken too much. Place the couscous in a small pot. Add the lemon juice and stock. Stir in the thyme and salt. Cover and bring to a boil. As soon as it boils remove from the heat and let sit, still covered, for 5 minutes.